Cool posters for dorm rooms featuring your favorite musicians are must have dorm items on your college dorm checklist. You'll get to express your interests and personality right in your dorm room decor. Plus, what's better than being surrounded by college posters of your favorite musicians every day?! You're going to need some inspiration to get through those tough, long college essays and maybe a dorm room poster of your favorite musician is the inspiration you need. However, maybe you want something a little bit different from an average photograph of your favorite musician in a college poster. 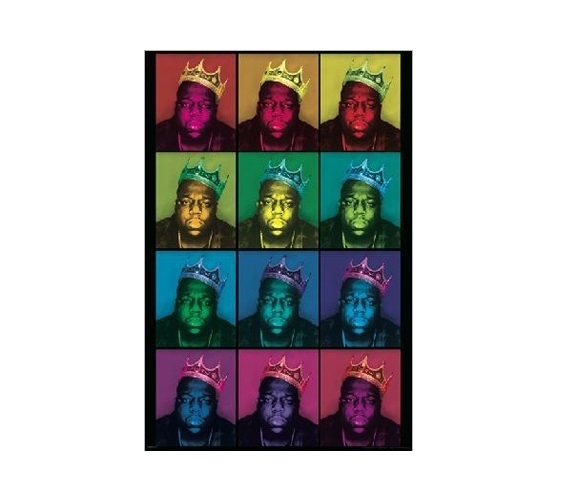 Our Notorious Big Pop Art Poster for Dorm Rooms is a cool looking dorm room decor item. A must have dorm essentials item for fans, this dorm room poster is really a piece of dorm wall art. This cheap dorm decor item features the same photograph of Notorious Big repeated across the dorm poster. What makes this college supplies item really unique is the style of it. This dorm room wall decoration has a different set of colors highlighting each photo in a pop art style. This dorm essentials item has a black border around each photo with thicker borders on the left and right edges, making this dorm item pop with color and style even more!